»A Visit to Karni Mata Temple, Where Rats Are Worshipped! A Visit to Karni Mata Temple, Where Rats Are Worshipped! Located in a small town Deshnoke near Bikaner in Rajasthan, the Karni Mata Temple is one of the unique attractions of that region. These holy rats are called kabbas and devotees visit the place from various parts of India, making it a popular temple of the state. The story behind the temple's existence is quite interesting. It is believed that Laxman, who was Karni Mata's stepson, drowned in Kapil Sarovar as he was trying to drink water from it. On seeing this, Karni Mata prays to Lord Yama to revive Laxman's life, and the Lord blesses Laxman and the other male children to be reincarnated as rats. There is one more legend related to the temple that is popular among the locals here. It is said that a group of soldiers had come to Deshnoke leaving a battle, and as a punishment, Karni Mata turned them to rats. However, the rats here are worshipped and are considered holy and auspicious. The temple is one of the temples dedicated to animals in India. The temple has around 20, 000 rats that are found all around the temple premises. 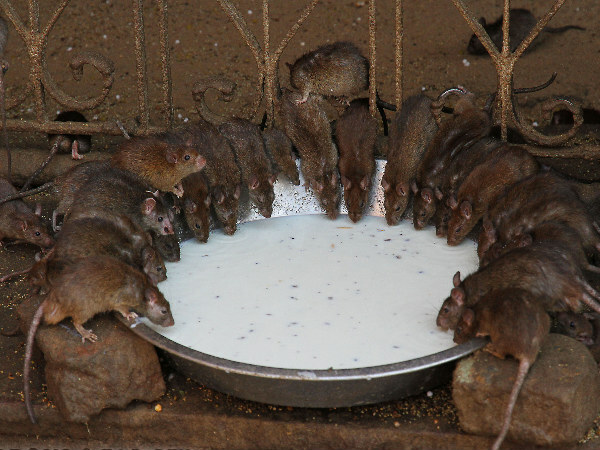 The milk offered here as prasad to the devotees are first fed to the rats. It is believed that the milk that is first tasted by the rats brings good luck and prosperity. Spotting a white rat in the temple is considered auspicious. Hence, once a white rat comes out of its hiding, devotees chase it to get a glimpse, scaring away the rat. The temple is to be entered barefoot like any other temple, and it's believed to be lucky if your feet are being trodden upon by the rats. Karni Mata Temple is heavily influenced by Mughal architectural style. The temple is built in sandstone, with the doors to the Sanctum sanctorum in silver. The carvings on the temple also include images of rats. Karni Mata Fair, which is the major festival held at the temple, happens twice in a year. The fair takes place during September-October and March-April during Navratras. During Navratri, the temple sees an unusual rush of devotees. The temple is located just 24km from Bikaner, and can be easily accessed by road from Bikaner and Jodhpur. The nearest airport is Bikaner airport which is 25km from the temple. You can visit Deshnok in the happy summer months of April to July when the temperature is around 46.3 °C - 36.4 °C. Or during the drizzling months of July to September with a temperature range of 26 °C - 44 °C or the cold winter days of December to March from 4 °C - 15°C. By Air: The nearest domestic airbase to Deshnok has to be the Jodhpur Airport. Foreigners can travel via the Indira Gandhi International Airport of New Delhi. Fortunately, this airport is connected to many Indian locations like Chennai, Bengaluru, Kolkata and Mumbai through frequent flights. You can always avail a taxi from the airport to Deshnok at a minimal price. By Rail: There are regular trains from Deshnok which is nicely connected to all major cities. The railway station you should know about is Deshnoke. By Road: Buses can be availed for Deshnok from nearly all major cities of India. The bus-stop goes by the name Deshnok Bus Station. Do leave us your feedback in the comments section below and do not forget to visit this temple during your trip to Rajasthan!